Ahhh gravy. GRAVY IS THE BEST. Oh, I’m highly medicated right now. Pulled my back and things are painful. But no better time to re-share my gravy recipe with you. I shared this a couple years ago when I made poutine pie. #america. We’re really proud of our gravy in my family, and my friends are always in agreement. It takes a little more elbow grease than your standard gravy recipe, but it’s worth it, I promise. Allow me to preface this by saying that the following should be the veggie mix that cooks underneath your turkey when roasting. So whatever you used to cook your turkey (onions, carrots, celery, herbs, seasonings, etc), that’s what you should be using here. But the recipe below doesn’t mention the turkey, so just be aware that I’m assuming you have turkey drippings all over your veggies as the gravy base. If you are just making gravy, throw some turkey, chicken, or even bacon on top of your veggies to get some kind of fat in there. Or, you can just make a veggie gravy and use veggie stock. Your call. Throw carrot, onion, and garlic in a shallow roasting pan and toss with vegetable oil, 1 tbsp butter, 1 tsp sea salt, and 1/2 tsp black pepper. Feel free to add meat like bacon, chicken legs, or turkey legs. Roast for 35-40 mins until nice and soft. Bonus: your house will smell amazing. Squish the vegetables a bit in the pan using the back of a fork. Just trust me here. 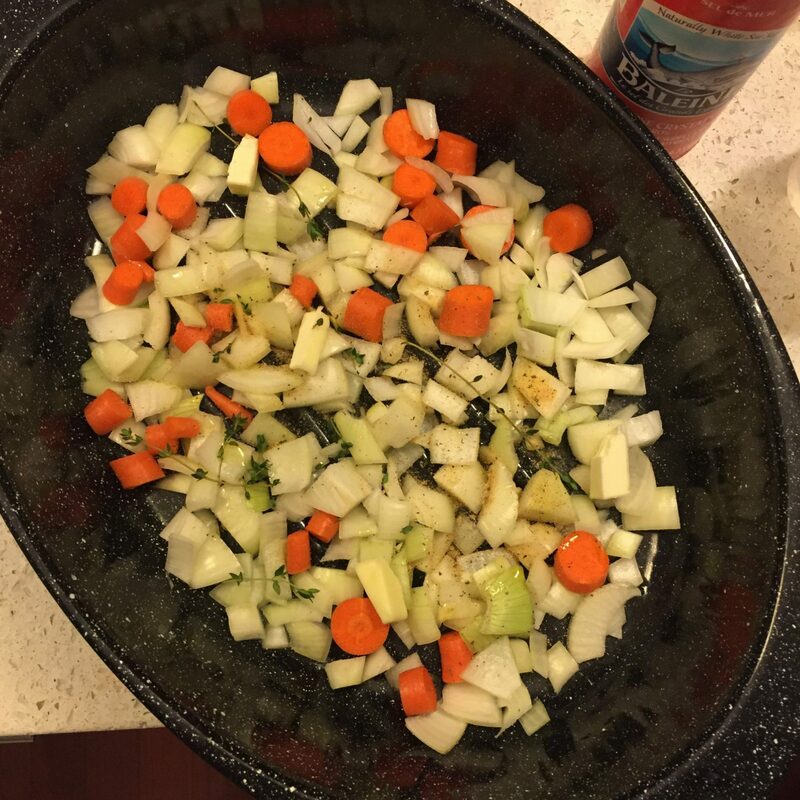 The veggies not only add flavor, but they act as a thickening agent as well. Scoop out veggies and set aside. Pour the can of beef stock into the roasting pan that held the veggies. Scrape up any bits on the bottom and mix it around. I like to heat this over the stove for a bit too, but you don’t have to since the pan will still be hot. Add the mushed veggies to a medium saucepan over medium-high heat and saute for a minute. Add the flour and 2 tbsp butter to the veggies to make a roux of sorts. This is your main thickening agent for the gravy. Add the stock from the roasting pan to the veggie-roux in the saucepan and let simmer on medium-low heat for 10 mins or so. Strain gravy and veggies through a mesh strainer over a bowl. Mush the veggies again to get all the gravy out and through the strainer. Add the gravy back to the pot and set over medium-high heat. It should be mostly smooth. I personally like to keep some of the veggies in the gravy though – I think it adds the most flavor. Add lemon juice, ketchup, Worcestershire, and S & P to the gravy to taste. Let reduce a little over medium high heat, and keep warm on stove. When ready to serve that turkey, pour into a bowl or gravy boat. Because who doesn’t love a gravy boat?